Wilmer Ebert Shantz (July 31, 1927 – December 13, 1993) was an American Major League Baseball player. 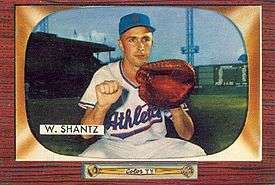 Shantz played for the Philadelphia/Kansas City Athletics and the New York Yankees in 1954, 1955 and 1960. Shantz batted and threw right-handed. He was born in Pottstown, Pennsylvania and died in Lauderhill, Florida. His older brother, Bobby Shantz, a left-handed pitcher, played in the Majors for 16 seasons (1949–1964) and was the Most Valuable Player in the American League in 1952. This article is issued from Wikipedia - version of the 6/22/2016. The text is available under the Creative Commons Attribution/Share Alike but additional terms may apply for the media files.